Legal and policy scholars modeling direct actions into substantive topic classifications thus far have not employed computational methods. To compare the results of their conventional modeling methods with the computational method, we generated computational topic models of all direct actions over time periods other scholars have studied using conventional methods, and did the same for a case study of environmental-policy direct actions. Our computational model of all direct actions closely matched one of the two comprehensive empirical models developed using conventional methods. By contrast, our environmental-case-study model differed markedly from the only empirical topic model of environmental-policy direct actions using conventional methods, revealing that the conventional methods model included trivial categories and omitted important alternative topics. Provided a sufficiently large corpus of documents is used, our findings support the assessment that computational topic modeling can reveal important insights for legal scholars in designing and validating their topic models of legal text. 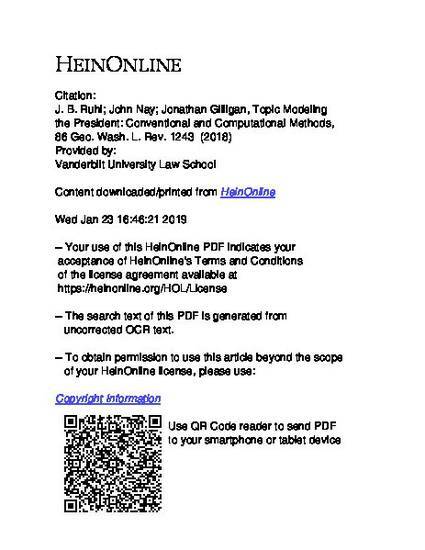 To be sure, computational topic modeling used alone has its limitations, some of which are evident in our models, but when used along with conventional methods, it opens doors towards reaching more confident conclusions about how to conceptualize topics in law. Drawing from these results, we offer several use cases for computational topic modeling in legal research. At the front end, researchers can use the method to generate better and more complete topic-model hypotheses. At the back end, the method can effectively be used, as we did, to validate existing topic models. And at a meta-scale, the method opens windows to test and challenge conventional legal theory. Legal scholars can do all of these without "the machines," but there is good reason to believe we can do it better with them in the toolkit.